Lythirus is a lobster-like Bakugan. He is the Guardian Bakugan of Stoica, a member of the Twelve Orders. Lythirus is partners with Stoica of the Twelve Orders. 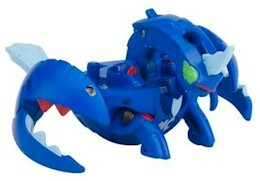 He is a ferocious and savage Bakugan, whose style is a combination of insect and reptilian fish. Lythirus can cut anything up with his big scissor-like hands. He is usually calm, but once he gets angry, he goes on a destructive rampage. He is obsessed with winning and he will use any dirty trick to get the job done. His Battle Gear is Razoid. It was revealed at the World Toy Fair 2010. The Subterra Lythirus is 630 Gs. The Darkus Lythirus is 640 Gs. The Pyrus Lythirus is 800 Gs and the Ventus version is 800 Gs. The Aquos Deka Lythirus is 760 Gs. The BakuCore Aquos version is 850 Gs. Purchase your Lythirus Bakugan from Amazon now!